In 1987, Vietnam veteran S. Brian Willson sat down on the railroad tracks outside the Concord Naval Weapons Station in California to protest a shipment of weapons intended to arm the Nicaraguan Contra army. Underestimating the U.S. Navy’s intolerance for peaceful protest, Willson lost both of his legs and suffered a fractured skull when the train was ordered not to stop. After witnessing US savagery during the Vietnam War, Willson realized that power came not from bearing arms, but from bearing the truth. 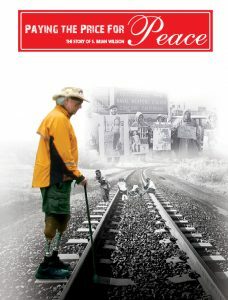 His journey to peace is interwoven among interviews with Martin Sheen, Daniel Ellsberg, Alice Walker, Ron Kovic, and narrated by Emmy Award-winner Peter Coyote, “Paying the Price for Peace” is a film that will embolden all people who strive for peace.